In these weeks we are in the midst of several celebrations which have particular importance for us here in the Diocese of Orange. First of all, we are in the midst of a number of celebrations in California and around the world of the 300th birthday of Blessed Junipero Serra. In the midst of this time of the “New Evangelization” it would be well to recall this “first evangelization” here in California by Blessed Serra. His motto “Siempre adelante” are words for us each day God gives us. One of the fruits of his missionary endeavors are the missions both in “baja” and “alta” California, which are still not only tourist destinations, but places of study for the young people of California. It would be well for us to remember that the Faith was celebrated here before the celebrated locations in the Northeast of our United States! A quick review of many of the cities here in California will remind us of the origins of these cities from the efforts of Fr. Serra: San Diego, Los Angeles, Sacramento, San Francisco, for example! 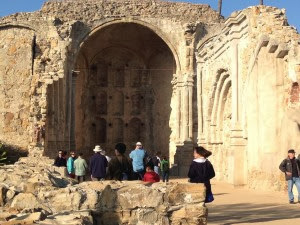 Our beloved mission of San Juan Capistrano takes its name from him, which was given by Blessed Serra. On a popular note, it is said that the swallows leave Capistrano on this day to return on St. Joseph’s Day, March 19.